Take an overland adventure from Vietnam’s bustling Ho Chi Minh City to enchanting Angkor Wat. Travel through diverse landscapes, ranging from tropical beaches to rural villages and from busy cities to a mountain oasis. Throw out the guidebook and let a local show the way through these two remarkable countries. Depending on the arrival time, enjoy a half-day tour of vibrant Ho Chi Minh City. Visit the Reunification Hall. Formerly known as the Presidential Palace, it was this building that North Vietnamese tanks seized on the morning of April 30 1975, as Saigon fell and Vietnam had won the war. This fascinating building is filled with history still fresh in the minds of many. 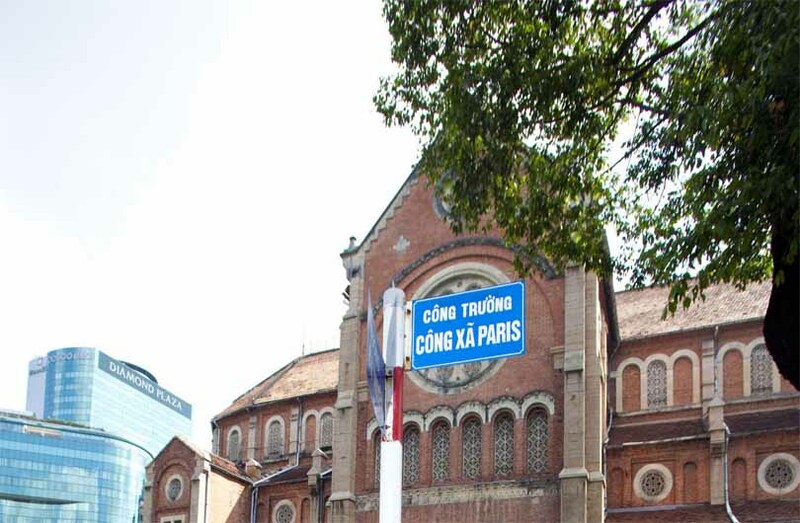 Continue to the Old Post Office, the Notre Dame Cathedral, then Cholon, the city’s Chinatown District. Discover the Cantonese Thien Hau Pagoda – dedicated to the goddess of the Sea. The final stop is at Ben Thanh Market— the central market for the city and one of its liveliest and most colourful areas. After perusing the market, transfer back to the hotel. Spend the rest of the evening at leisure. Head out for some independent exploration of the city’s famous nightlife or tuck in early for the evening. 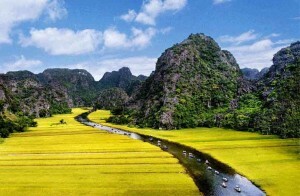 Depart Ho Chi Minh City at 08:00 in the morning for the drive to Tay Ninh. Leaving the city behind, the scenery changes to views of rice paddies, villagers drying noodles by the side of the road and other scenes typical to southern Vietnam. 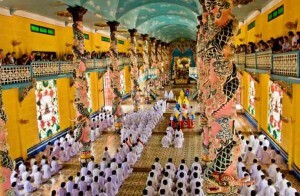 At Tay Ninh, visit the Cao Dai Great Temple, with architecture that could have come straight from a Walt Disney fantasy and where all the major faiths of the world blend together in a religious cocktail unique to Vietnam. After lunch in a local restaurant visit the famous Cu Chi Tunnels, which consist of an incredible underground tunnel network constructed by Vietnamese resistance fighters (Viet Cong) during both the French and American wars. Start the visit with the Ben Dinh or Ben Duoc sections of the tunnel. Here, imagine what it was like to be a guerrilla complete with Russian Carbine rifles and AK 47’s. In the late afternoon, journey back to Ho Chi Minh City. The specialist guide at Cu Chi will be a war veteran who fought in the tunnels for 12-years from 1963 – 1975. Affectionately referred to as ‘Uncle Nam’, hear firsthand accounts on how he lived, fought and survived in the Cu Chi Tunnels. This morning, take a short flight from bustling Ho Chi Minh to the island of Phu Quoc. 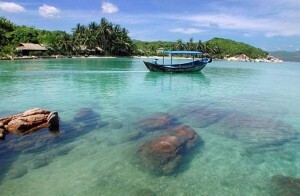 Located in the Gulf of Thailand, Phu Quoc is one of Asia’s least-developed beach destinations. The island’s clear waters, undiscovered beaches, forested interior and charming local character make for an ideal holiday escape. On arrival, transfer to the hotel by shuttle bus and enjoy the rest of the day at leisure. This is a full day at leisure. Spend time lounging on the beach, take a dip in the island’s clear waters, or simply relax and enjoy the ambience of the hotel while sipping coconuts or cocktails under a palm tree. This morning, a speed boat ride heads from Phu Quoc to the pretty port town of Ha Tien. Stop here for lunch before continuing to the border to Cambodia at Xa Xia (NOTE: Cambodian visas are not available on arrival). Upon arriving at Xa Xia, Cambodia (visas available on arrival for most nationalities), be met by the local guide. Then, drive approximately 40 minutes to Kep. Cambodia’s prestigious seaside resort of the 1960s, this town is now awakening to its former glory and offers reminders of the past and a growing choice of activities including island trips, a national park and the famous crab market. The afternoon is at leisure to relax in the resort or stroll through town, where crumbling former holiday villas are contemporary witnesses to Kep’s glorious times. Early in the morning, embark on a 30-minute boat trip to Koh Tonsai (Rabbit Island) and spend the morning at leisure exploring the island’s beautiful beaches. Enjoy a seafood barbecue lunch on the beach before returning to Kep. This afternoon, have the chance to explore Kampot. This charming riverside town with magnificent surroundings is still dominated by French colonial architecture and the people are very open and friendly. Explore the laid-back town on a walking tour and absorb the pleasant atmosphere. From there, transfer to Kirirom National Park. On the edge of the Cardamom Mountains, it’s a scenic drive of about three and a half hours. Cambodia’s first established National Park, it’s particularly popular due to its many lakes and beautiful waterfalls. Stay overnight at the Kirirom Hillside Resort. Overnight in Kirirom National Park. Today, explore the spectacular scenery of Kirirom National Park. The name Kirirom means “Mountain of Joy” and the park is recognised for its unique high-elevation pine forest as well as its rare endangered animals such as pleated gibbons, sun bears and tigers. Go on a short trek of 3km to the beautiful, 40-metre high Chambok Waterfall at the Chambok Community-based Ecotourism Site. A delicious home-cooked lunch is served in the local community. In the afternoon, head with the local guide to a bat cave and take a traditional ox-cart ride to experience the local way of life. To cool down, take a swim in the refreshing small river that runs through the park. After breakfast, transfer to Phnom Penh (transfer 3h). Phnom Penh was once considered one of the most beautiful cities in the Orient and, despite its recent turbulent history, it still retains a colonial charm as much of its original architecture remains. Cambodia’s capital is a bustling city majestically located at the confluence of the mighty rivers of the Mekong and the Tonlé Sap. Wide tree-lined boulevards and many colonial-era buildings reflect the glorious days and add to the charm of the city where Asian traditions meet Western customs in a fascinating way. This afternoon, be greeted by the cyclo driver and head on a tour to the most remarkable sights of Phnom Penh, a very fun way to explore this lively city. First, head to the National Museum which houses the world’s foremost collection of ancient Khmer archaeological, religious, and artistic artefacts from the 4th to the 13th centuries. Over 5,000 pieces are on display, constituting a repository of the Kingdom’s cultural wealth. In addition, the roof space is home to a large bat colony! Continue to the Royal Palace. This palace dates back to 1866 and was the last palace built during the French colonial period. The same complex houses the Silver Pagoda, named for the over 5,000 heavy silver tiles that cover its floors. Its original name is Wat Prakeo, meaning Temple of the Emerald Buddha. In this temple, view a collection of Buddhas in gold, silver, crystal, and bronze. Depart early in the morning for Kampong Thom. The transfer takes around 3 hours but will be rewarded with beautiful views of paddy fields and traditional local villages on the way. Near Kampong Thom, head towards the rarely visited Sambor Prei Kuk, one of the most important pre-Angkorian sites in the country that is enlisted to potentially become Cambodia’s next UNESCO World Heritage Site. Sambor Prey Kuk was built in the Chenla Period between the 6th and 7th centuries and there are over 100 well-preserved temples scattered in the forest. The three main sites are linked by small and shady tracks. Enjoy a beautiful walk through the jungle with breathtaking views. The visit supports a community-based tourism project as an added benefit. The villages around the temple complex still practice the ancient art of craft making, using materials such as bamboo and rattan. Stop at one village to observe the local production. The community runs the Isan Borei Craft Hut next to the temples and sells their products there as part of a community-based tourism project. Then have the chance to visit and contribute to the people’s livelihood as the local community prepares a simple but very tasty lunch near the temple. On the way, stop at the Khmer-era Spean Praptos Bridge near Kampong Kdei. More than 1,000 years old, walk the short distance across what used to be the longest corbeled stone-arch bridge in the world, with more than twenty narrow arches. The bridge was built in the 12th century during the reign of King Jayavarman VII and is one of few remaining bridges to have survived from the Khmer Empire to the modern day. After, continue to Siem Reap and check in to the hotel. This afternoon, depart by ‘remork’ (similar to the Thai tuk tuk) on a very special sightseeing tour of the famous Angkor Wat. Built during the reign of King Suryavarman II in the early 12th century, Angkor Wat is constructed following the model of the temple mountain symbolising Mount Meru, home of the gods. The divine residence of Vishnu, the King himself was to reside here after his death. Inside the temple, the walls are covered with stone carvings and bas-reliefs depicting Hindu mythology and the wars Suryavarman II fought during his reign. Moreover, Angkor Wat is well known for the more than 2,000 Apsara dancers decorating the temple. Construction is thought to have taken around thirty years of intensive labor. Today, Angkor Wat is figured on Cambodia’s national flag as the temple symbolising the soul of the Khmer people. Highlight the day with watching the sun set over Angkor Wat. Embark on an interesting boat trip on the Tonlé Sap Lake, and have an opportunity to learn about life on the lake. 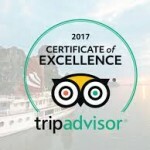 The Tonlé Sap Lake is the largest freshwater lake in Southeast Asia and officially designated as a UNESCO Biosphere Reserve, covering an area of around 250,000 hectares in the dry season. Due to a unique phenomenon, when the monsoon begins, the swollen waters of the Mekong River force the Tonle Sap River to reverse its flow northwards, feeding the Great Lake and spreading over the surrounding floodplain. Board a local boat and visit Kompong Phluck, a village with houses on stilts that are submerged when Tonlé Sap Lake extends. 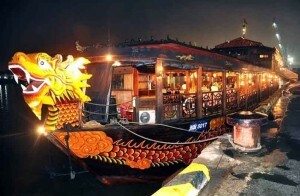 On the way, pass floating houses and impressive flooded forests, portraying life on the water. Take a break by disembarking for a tasty picnic lunch served in a floating house and enjoy the views as the local community goes about its daily life (Note: Due to low water levels during the dry season, the boat trip is only possible from June to March. However an alternative floating village at Chong Kneas can be arranged instead). Later this afternoon, explore the temples of the Small Circuit. Start the tour with a visit to Ta Prohm Temple, built in the mid 12th to early 13th centuries. Ta Prohm is unique in that it has been left largely as it was found: overgrown by jungle trees and vines, with many parts of the temple crumbling to the ground. This makes Ta Prohm one of the most picturesque and memorable of the Angkor temples. The visit will also include Banteay Kdei, a Buddhist monastery from the late 12th Century, and Srah Srang, also known as the “pool of ablutions”. Continue to the ancient city of Angkor Thom. Angkor Thom was the last capital of the Great Khmer Empire under the reign of Jayavarman VII. This city is surrounded by an 8 metre-high wall, drawing a perfect square. Enter the city from the ancient South Gate, an impressive stone gate carved with Elephants and four giant faces. From here continue to the Bayon Temple in the exact center of the city. The particularity of this monument is the 54 towers with four faces representing the 54 provinces of the then Great Khmer Empire. Finish the tour at the terrace of the Elephants and the Terrace of the Leper King. Early this morning, travel to the “gem” of the Angkor area, the pretty temple of Banteay Srei which is best viewed in the morning light. The so-called “Citadel of the Women” was built between the 11th and 13th century and remains the best preserved in Cambodia. It displays some of the finest examples of classical Khmer art as this small temple is noted for its truly remarkable fine bas-reliefs. Continue north to Kbal Spean, one of the earliest Hindu pilgrimage sites in Cambodia. A moderate 3 km trek up the hill through dense jungle will be rewarded with the “River of 1,000 Lingas” with its amazing Hindu stone carvings of Hindu gods, animals and phallic symbols in the river bed. During, and after the rainy season, a swim in the beautiful waterfall is a refreshing experience and is a popular location for local tourists. Then continue to the Angkor Centre for Conservation of Biodiversity, the first nature conservation centre in Cambodia. The aim of the centre is to rescue, rehabilitate, breed and re-introduce threatened wildlife, providing environmental education, promoting wildlife conservation and training local villagers in the sustainable use of natural resources. Here, see various endangered species, reptiles and a beekeeping project. On the way back to Siem Reap, stop at the Landmine Museum which promotes mine awareness and education. Mr. Aki Ra, the museum founder, was a child soldier during the Khmer Rouge regime and is today working as a de-miner. The museum serves also as a rescue center for a number of landmine amputee children that Aki Ra had brought off Phnom Penh’s streets or from impoverished rural communities. Transfer back to Siem Reap in the afternoon. After this fascinating day transfer back to Siem Reap for a well-deserved dinner with traditional Khmer dance show. This morning will be at leisure until transferring to the airport for a short flight to next destination.